Canada's Wonderland is located just minutes north of Toronto off Highway 400, just 10 minutes north of Highway 401. Exit Rutherford Rd. if heading north or south on Highway 400. By Public Transit the Wonderland Express "GO" Buses run regularly from Yorkdale and York Mills subway stations. Schedule operates throughout the day and evening through closing. York Region Transit offers several routes to Canada's Wonderland. YRT Routes 4 and 20, as well as TTC Route 165A operate directly into the park. 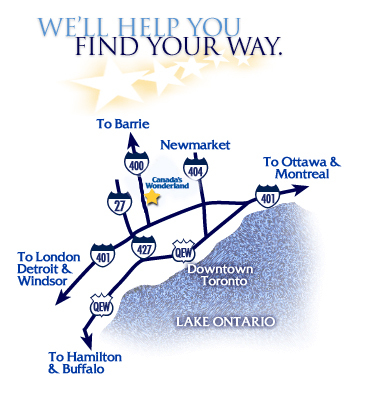 For more YRT route and schedule information, please visit the YRT/Viva website. Website Design & Marketing By Rootways inc.